Pasquale Forte made his mark producing seriously impressive wines. Then he turned his attention to restoring the nearby hilltop town Rocca d'Orcia, opening an art gallery, a home-goods store, an enoteca and an osteria headed by chef Enrico Bartolini. Pasquale Forte made his mark producing seriously impressive wines at Podere Forte, his Val d'Orcia winery. Then he turned his attention to restoring the nearby hilltop town Rocca d'Orcia, opening an art gallery, a home-goods store, an enoteca and an osteria headed by chef Enrico Bartolini. Bartolini builds his menu around impeccably sourced local ingredients, like a gorgeous sirloin steak grilled over a beech-and-oak-wood fire and served with "sandy" potatoes cleverly tossed with herbed bread crumbs. 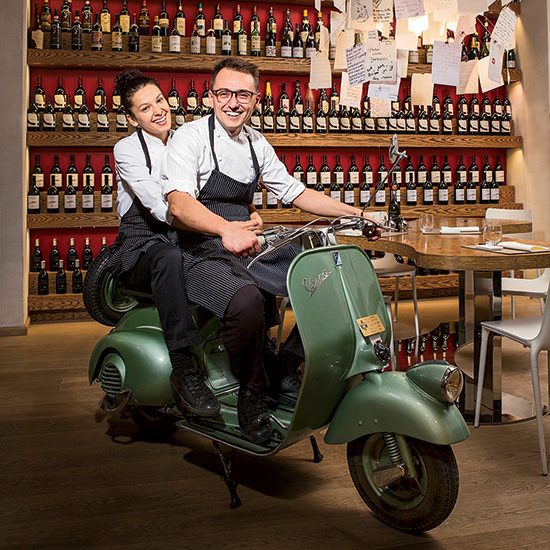 The enoteca sells some of Forte's favorite wines, along with specialties like cured meats from Tuscany's famous Cinta Senese pigs. Next on Forte's Rocca d'Orcia to-do list: launching artisan ceramics and furniture stores, as well as a luxurious hotel with rooms scattered throughout the village. trecerchi.com.